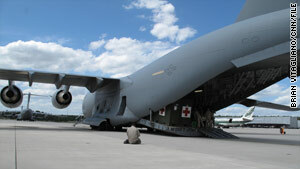 The curfew order was issued Thursday to all Air Force military personnel at Ramstein Air Force Base. Washington (CNN) -- Thousands of U.S. military personnel in Germany were ordered to maintain a curfew and stay in their homes Friday night due to rising concerns about the possibility of a terrorist attack. The order -- signed by Brig. Gen. Mark Dillion, head of the US Air Force 86th Airlift Wing at Ramstein -- was issued Thursday to all U.S. Air Force military personnel stationed at Ramstein Air Base in Germany as well as several nearby housing areas that are home to both Air Force and Army military personnel. All military personnel in the area of Kaiserslautern were covered, according to the order which was obtained by CNN. Ramstein is a major air hub for U.S. military operations in Europe. The ordered curfew extended from 11 p.m. Friday night until 5 a.m. Saturday morning. It preceded an announcement by the State Department on Sunday that a travel alert had been issued for U.S. citizens in Europe, based on information that suggests that al Qaeda and affiliated organizations continue to plan terrorist attacks. Americans are warned to be aware of their surroundings and protect themselves when traveling, especially when they are in public places like tourist sites, airports or when they are using public transportation. The alert does not warn U.S. citizens against travel to Europe. A U.S. military official confirmed to CNN Sunday that Thursday's order was carried out and the curfew was observed. He declined to be identified because the security of military personnel is involved, which is considered a sensitive matter. The official and other U.S. military sources in Europe confirmed to CNN that security measures in recent days have been altered, temporarily in some cases, at several U.S. military locations across Europe. The officials all agreed the measures are in part due to ongoing concerns about recent intelligence indicating an attack could be being planned in Europe. It is expected security measures will be randomly increased and then potentially lifted over the coming weeks. The officials said they were not aware of a specific imminent threat for the timeframe of the curfew. The order also mandated that military personnel at Ramstein not wear any military uniform clothing or items off base from 6 p.m. Friday 6 p.m. Saturday. The curfew and uniform restriction order was somewhat unusual given the specificity of what it orders troops to do. The order was mandatory, stating violators could face military charges. In a second order, also issued Thursday and signed by Dillon, the level of "force protection" was temporarily raised at several military locations including Ramstein, to level "Charlie" -- the second highest level of force protection. It was done "in light of recent terrorist threats," according to a copy of that order obtained by CNN. Although the higher designation was lifted Saturday, one of the reasons it was instituted was to determine how increased security levels could be maintained over a long period of time. It is difficult for a military base to maintain higher security levels for an extended period of time because it opens the possibility to having to search every vehicle entering a base. Approximately 21,000 cars a day enter Ramstein's gates, the order noted, so commanders want to experiment with staggered work hours in case the higher levels of protection are put in place for an extended period. When asked about the public discussion of rising terrorism concerns in Europe, a senior U.S. military official in Europe told CNN, "While I would not want to describe any actions we may be taking at present, we are carefully monitoring the reports that you mention." A second senior U.S. military official said, "U.S. military installations are taking prudent precautions. This is a serious situation." On Sunday, Adm. James Stavridis, the head of the U.S. European Command publicly acknowledged the situation, posting a statement on his Twitter account and Facebook page stating, "Working security at U.S. installations given widespread reports of possible terrorist attacks." U.S. military commanders have the discretion at their individual bases to adjust security conditions as they see fit. Stavridis in recent days has reminded all top commanders in Europe to review their measures to protect U.S. troops and their families in Europe.